Atlantis moved to its launch pad at Kennedy Space Center (KSC) in Cape Canaveral, Fla., on May 31, with final preparations under way for its planned liftoff on July 8 at 11:40 a.m. EDT (1540 GMT). On May 17, Atlantis made the trip from its processing hangar at KSC to the 52-story Vehicle Assembly Building (VAB), in a procedure that NASA calls "rollover." To get to the VAB, Atlantis travelled on a giant 18-wheel transporter platform. To mark the final shuttle missions, NASA has been inviting the thousands of workers who are part of the shuttle program to experience many of the major pre-launch milestones with their friends and families. During Atlantis' rollover, many NASA civil servants took photos alongside the orbiter they have worked on for decades. In the Vehicle Assembly Building at NASA's Kennedy Space Center in Florida, shuttle Atlantis is lifted by an overhead crane and moved into a high bay where it will be attached to its external fuel tank and solid rocket boosters which are already on the mobile launcher platform. NASA plans to launch Atlantis on the STS-135 mission in mid-July 2011. The next phase in the pre-launch preparations involves moving Atlantis from the VAB to its seaside launch pad. This process is known in NASA parlance as "rollout." 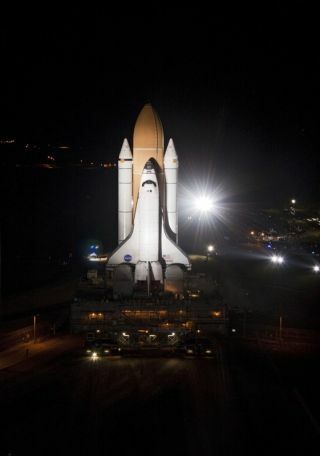 Atlantis began rolling to the pad just after 8:30 p.m. EDT (0030 June 1 GMT) on May 31, mere hours before Endeavour touched down at Kennedy Space Center's Shuttle Landing Facility. To make the 3.4-mile (5.2-kilometer) journey to Launch Pad 39A, the newly-assembled shuttle sits atop NASA's Apollo-era crawler transporter and slowly and carefully inches to the pad. It typically takes about six hours for a shuttle to roll out to the launch pad. With Atlantis now secured to its launch pad, ground teams are planning to perform what is called a "tanking test" on June 15, to make sure the shuttle's external tank is safe and robust to fly. Since Atlantis' external tank was constructed with the same materials and was manufactured during the same processing flow, engineers preemptively modified the tank the same way they did with Discovery's. The tanking test on June 15 will allow ground teams to collect data and assess how these modifications will hold up for launch. Engineers will take X-ray scans of the orbiter-facing side of a section called the intertank, which is the part of the external tank that caused troubles in the lead up to Discovery's launch. The tanking test involves fueling the orbiter and running through regular countdown procedures. "We're going to go ahead and do the tanking test to prove to ourselves that nothing unexpected happened, all our models are right, and we do understand how this [modification] performs," Mike Moses, chair of the shuttle's mission management team, said in a news briefing on June 1. "The X-rays are really that double check to show we understand the stresses that got put into the system. Obviously we'll look at the data and if we're not happy with what we see, we'll take the next course of action. It really is that safety check of that band-aid that we put on the tank." On June 23, Ferguson, Hurley, Magnus and Walheim will travel from NASA's Johnson Space Center in Houston to Kennedy Space Center in Florida for the Terminal Countdown Demonstration Test (TCDT). This two-day event acts as a practice run-through of the countdown and launch and is also the time when the astronauts receive emergency training at the Florida spaceport. This launch day practice run is the last major training exercise for the astronauts before their scheduled liftoff. In addition to countdown preparations and emergency training, the crewmembers also participate in a variety of media events during TCDT. The commander and pilot typically also have opportunities to practice landings at the Shuttle Landing Facility. The astronauts fly a modified Gulstream aircraft that simulates the shuttle's approach and landing. For their emergency training, the crew reviews procedures for the launch tower escape system, which is a 1,200-foot (366-meter) long "slidewire" that whisks the astronauts away from any danger at the pad. The crewmembers slide down in baskets to an emergency evacuation bunker nearby. The astronauts typically arrive at KSC four days ahead of their launch, but NASA is planning to observe the July 4th holiday weekend, said launch director Mike Leinbach.